Last Friday, I dropped off Tildy at the kennel for a weekend stay. I updated Kay, the owner of the kennel, about Tildy’s frequent accidents. She told me that her little dog went through the same thing and it turned out to be renal failure. Sufficiently scared out of my mind, I called the vet and got an appointment for first thing Monday morning. When I picked up Tildy on Sunday, Kay told me that they hadn’t noticed anything like the bladder emptying episodes that I had described. Hmmm…. Sunday night, I was not awakened by a wet spot or a request to go outside. Something in my gut told me to cancel the appointment, but I ignored that feeling and we went to the vet anyway. Monday night, no accidents and no requests to go outside. The vet called with the lab results on Tuesday evening. A series of tests and $300 later, I’m told that there is nothing wrong with her. The vet increased her dosage of Proin and told me to keep watch on her. Tuesday night, no accidents and no requests to go outside. Last night, the day after receiving the news from the vet, she had an accident and didn’t request to go outside. I’m thoroughly exhausted, frustrated, and confused. 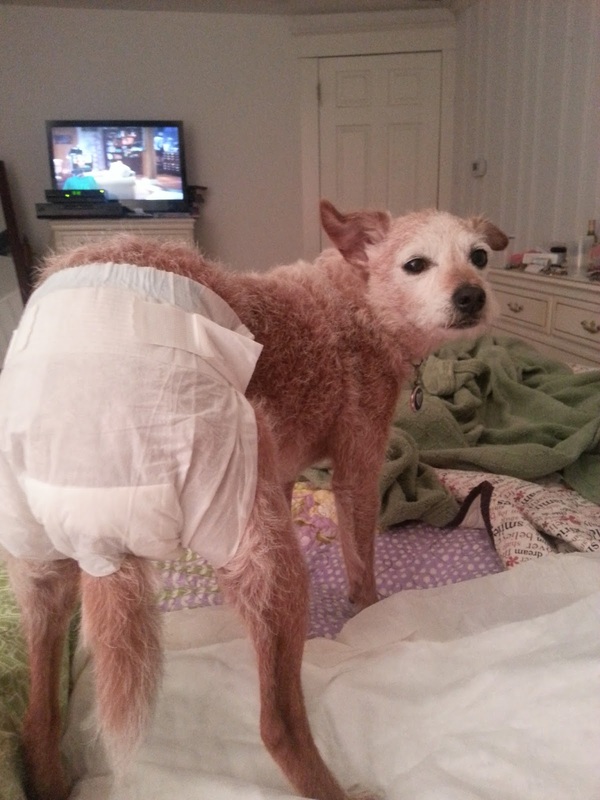 This entry was posted in Uncategorized and tagged accident, dog, incontinence, kennel, vet on August 8, 2013 by Kizzy T. Grace. I named this blog “The Tildy Spot” for a number of reasons. First, I thought of it as the spot that you could find out about Tildy…kinda like “the jazz spot around the corner” or “the burger joint down the street”. I also found myself saying it a lot when I first got her, especially when we were outside. “C’mon, Tildy. Find your spot so we can go home.” She also has spots in the house that she’s identified as hers and of course I refer to them as the Tildy spots. Over the past few weeks, she’s been leaving spots on the couch and the bed; large urine stained spots. I tried putting training pads all over the place, but inevitably, she would either move them before she laid down or she would find the one place that wasn’t covered with a pad. 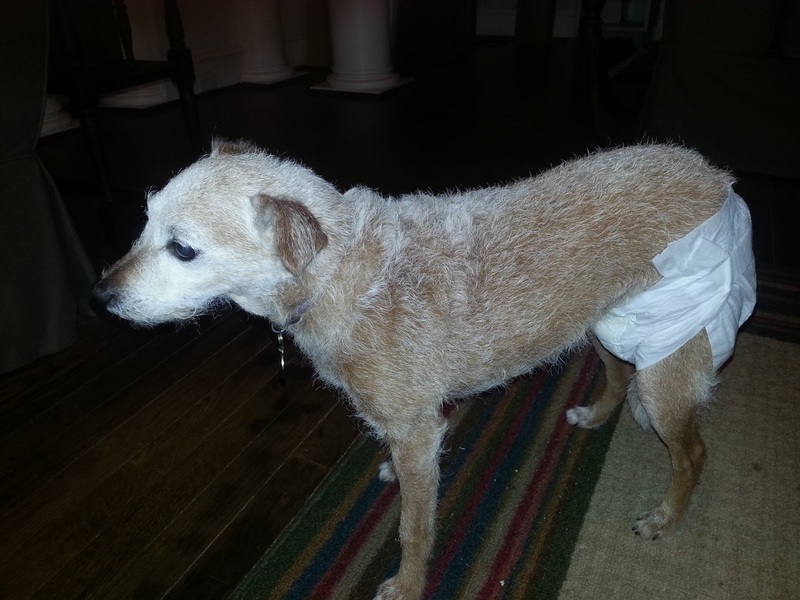 Yesterday, I broke down and bought doggie diapers. Getting her in one was somewhat of a challenge. She didn’t appreciate me putting her tail through the hole. She didn’t like the way they sounded. She didn’t like the way they constricted her movement. Here she is after I finally got one on her. She was not happy with me. Once we got upstairs for the evening, I had a sense of relief. I really thought I’d be able to sleep through the night without encountering a puddle and maybe, just maybe, she wouldn’t wake me up at zero dark thirty to take her outside. Those diapers gave me a false sense of security. 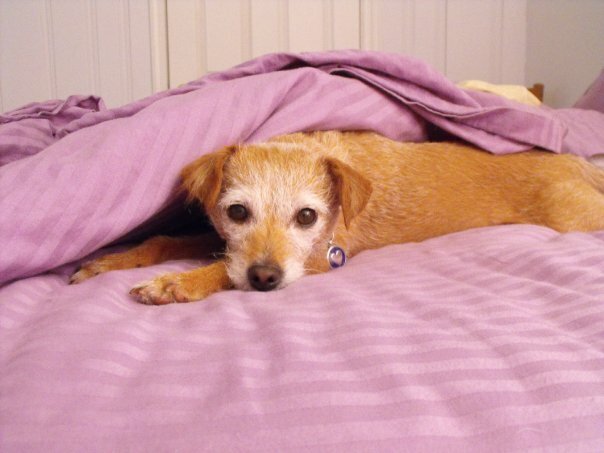 Around 2:00 this morning, I caught a whiff of urine and rolled over to find a huge wet spot on my favorite quilt. I turned my head to find Matilda pawing at me, which is her way of asking to go outside. As I got up to get dressed, I found a dry, completely intact diaper at the foot of the bed. She must be some sort of Houdini. 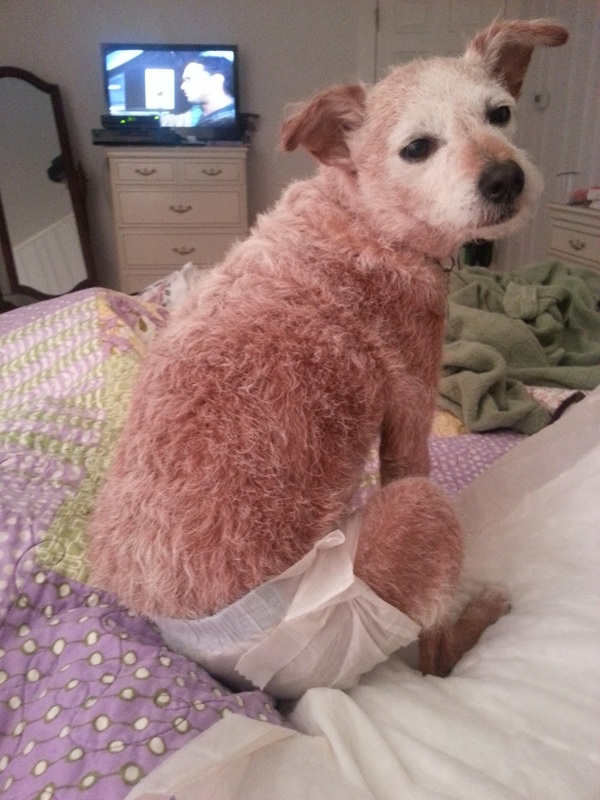 Pee pads and diapers aren’t working for us. 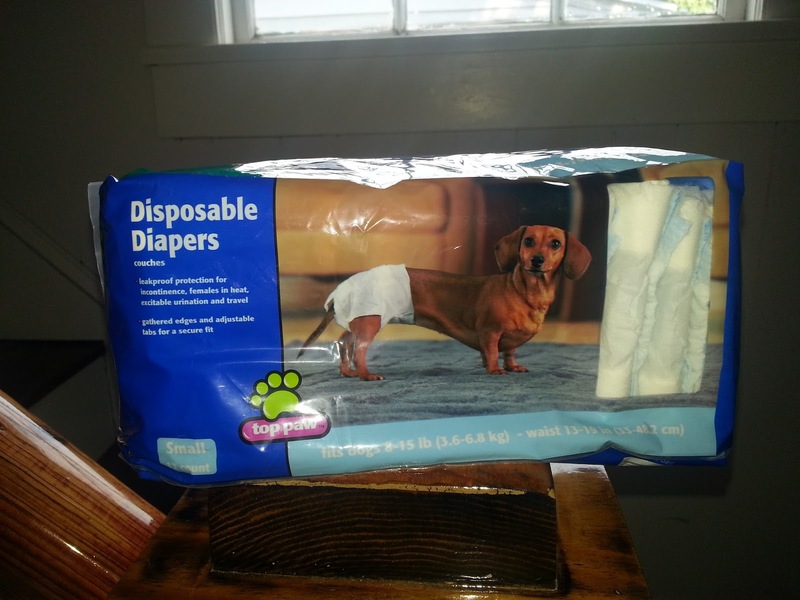 This entry was posted in Uncategorized and tagged accident, diapers, dog, Houdini, incontinence, pee pads, quilt, wet spot on August 2, 2013 by Kizzy T. Grace.